"For those who like pesto but also love tomato sauce, try this recipe. Quick to prepare and very good, too! Try serving with breadsticks." Bring a large pot of lightly salted water to a boil. Add ziti pasta, and cook until al dente, about 8 minutes. Drain. Place pasta in a large serving bowl. Toss with pesto-tomato sauce. 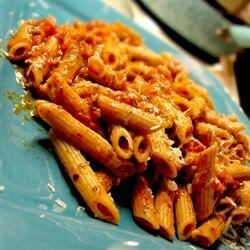 Top with grated Parmesan cheese. See how to make roasted tomato sauce served with goat cheese and pasta. I loved the sauce. I add turkey sausage with casings removed, 1 jar of roasted red peppers, and some scoops of ricotta cheese. Delicious. Boring. Easy. But pretty much boil ziti, put sauce on from jar and add Parmesan cheese... no special zing or flavor. Fantastic sauce idea! It's perfect when I don't feel like making a sauce from scratch. I add fresh, chopped portobello mushrooms to the sauce and let it simmer for a few hours before serving. This was ok. Not my favorite recipe from here, but also not the worst. I added meatballs and some sausage to the sauce to give it some protein. So easy and tasty! Even my 1-year old devoured it!